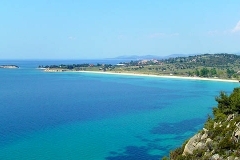 A very beautiful open area in Nikiti, Sithonia in Halkidiki. 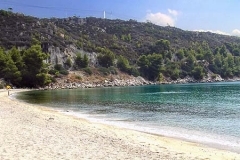 The beach is long and easily accessible thus it is suitable for sport activities and open concerts. There are two beach bars on the beach where you may enjoy drinks and food. The beach is easily accessible by car while there is plenty of parking space. However, you should take extra care when turning from the main road to the road that leads to the beach as other cars tend to increase their speed in that part of the road. Up in the hill above the beach, there is the little church of St. John (Ai Yiannis in Greek) dated from 19th century. The church gave its name to the area. 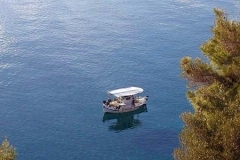 Just 200m away from the beach, on the main road to Neos Marmaras, there is a little café. 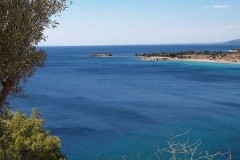 There, you may admire a panoramic view of Ai Yiannis beach and also of the coast of Sithonia that continues to the south. 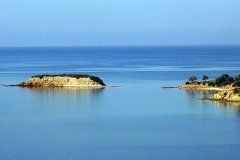 On the west side of the beach, there is a little rocky island named “Kastri”. You may go there even on foot, since the water is shallow. There are remains of ancient fortifications and other archaeological findings on the area and the surrounding area. 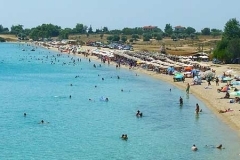 One theory links the area to the ancient city of Galipsos mentioned in Herodotus. Accessibilitiy: Good. Easy parking. Notice that the water is deep in some parts of the beach.